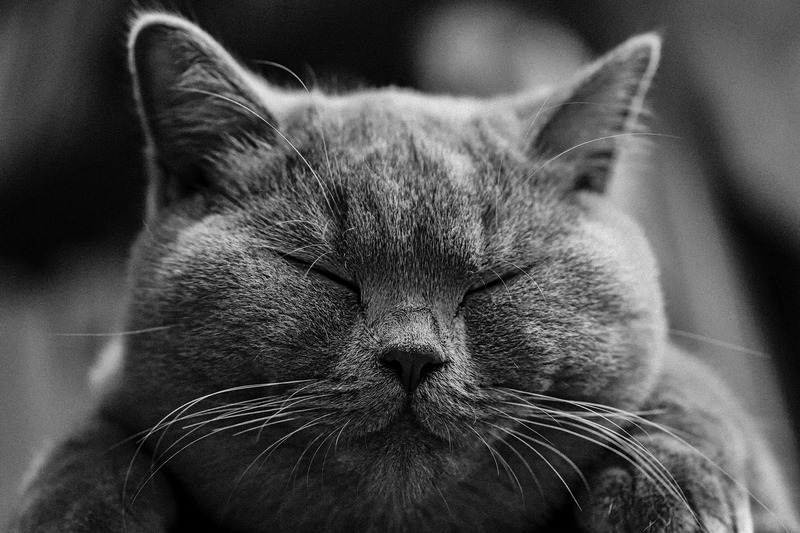 The chubby-faced British Shorthair with its chipmunk cheeks and happy smile is famous as the Cheshire Cat in Lewis Carroll’s Alice in Wonderland. This sturdy teddy bear has a smile and a plush coat combined with a wonderful disposition that makes them great family pets. It traces its ancestry back to the cats of Rome and is one of the oldest breeds of English cats. Once a hunter and protector of the barns, the British Shorthair now embraces family life, preferring to snooze in comfort by the fire and to exchange hunting for playing with toy mice. It is a dignified, affectionate cat, sometimes referred to as the Winston Churchill of the cat world, roaming its household dominion with all four feet on the floor. 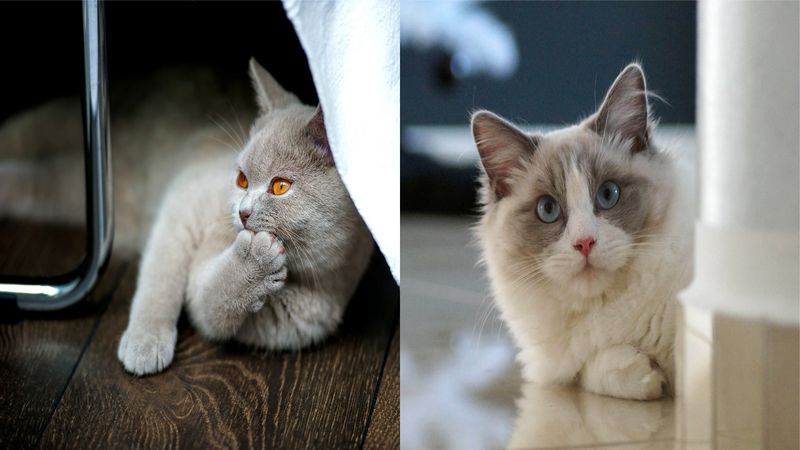 The British Longhair takes the recipe for the British Shorthair and adds a longer coat resulting in an imposing longhaired cat with all the same characteristics that have made the British Shorthair such a loyal companion. The British Shorthair origins begin with cats imported from Egypt that accompanied the Romans when they invaded Great Britain. One of the first breeds of the cat fancy, they have changed little over the centuries. As the breed developed, crosses were made with the Persian between 1914 and 1918 introducing the longhair gene. Cats with short coats were part of the British Shorthair and cats with longhair went into the Persian breeding programs. Early on, the blue shorthair consisted of two distinct types: the sturdy, compact British with its round head and the long, elegant Russian with its triangular head. The two types competed together and were interbred before finally separating into unique breeds. After WW1, the Governing Council of the Cat Fancy (GCCF) declared that only 3rd generation offspring of Persian/British Shorthair crosses could be shown. This reduced the breeding stock and the advent of WW II also affected the breed. 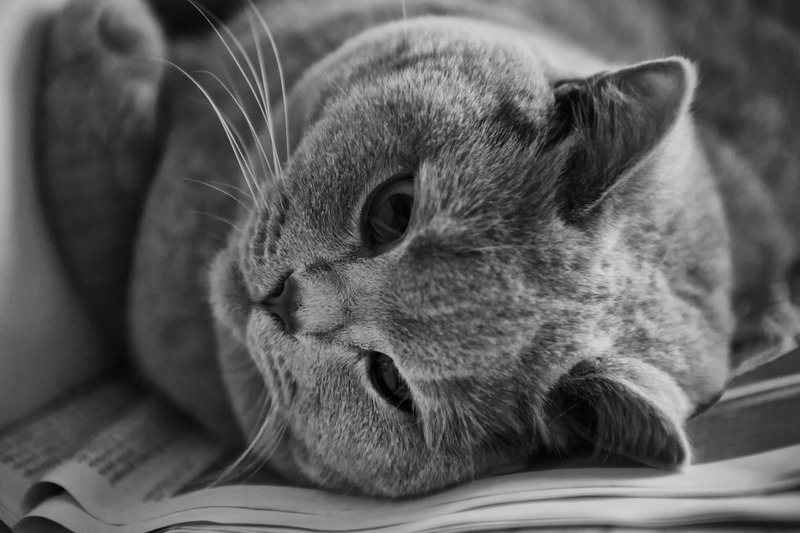 After WW II, the British Shorthair lines were all but lost so breeders crossed with domestic shorthairs, Russian Blues, and Persians among others. 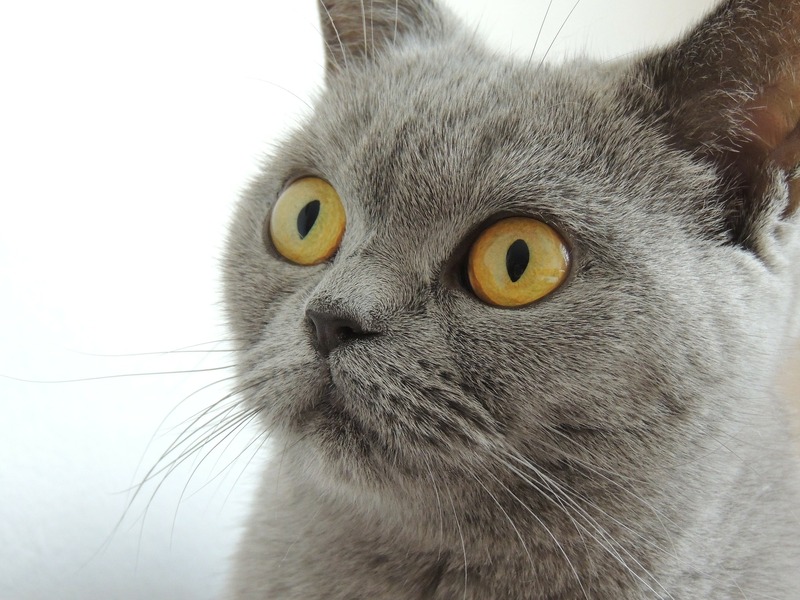 The British Shorthair has grown in popularity since then and gained championship status in TICA in June 1979. While longhair kittens sometimes appeared in litters, it languished in obscurity as a breed. Today, the imposing British Longhair is a fitting companion breed to the British Shorthair resembling the Persians and Angoras of the early 1900s, obtaining championship status in TICA effective May 2009. These genial British cats are friendly and affectionate, enjoying attention in an undemanding manner. The happy-go-lucky males command respect but welcome attention from everyone while the more serious females are true British ladies expecting proper form and etiquette from those whose attentions they accept. These loyal and devoted companions are not lap cats but want to be where you are, snuggling up beside you on the sofa. While not very active cats, they do have their mad moments to chase around acting the clown like kittens. These intelligent cats are quiet and unobtrusive ruling their indoor kingdoms with a calm demeanor. They definitely look before they leap and do not engage in high-flying acrobatics. They are tolerant with children and dogs but do not like to be carried around, preferring to maintain their dignity with their feet firmly on the floor. They are quite content with their own company, quietly amusing themselves in your absence and waiting patiently for your return. The British Shorthair has a short, extremely dense plush coat with a crisp feel to it making you want to bury your hands in its luxurious pile. The British Longhair adds length to the dense coat so it stands out from the body emphasizing the cat’s imposing lines. In most colors, large, round eyes ranging from deep gold through copper are set into the smiling face. In pointed cats the eyes are blue while deep green eyes shine in the silvers. The classic Blue remains the most popular color however the breed comes in a rainbow of colors. The British are medium to large, compact, powerfully built cats with a broad, full chest, short strong legs and a short, thick tail tapering slightly to a rounded tip. The British Shorthair has a massiveness that the plush coat emphasizes while the British Longhair cuts an imposing figure as the full coat swirls around the rounded, muscular body. Their round heads have short noses, chubby cheeks and prominent, rounded whisker pads creating an enigmatic smiling look to the face. The round eyes are wide open and, combined with the smile, give the cat an amused air as it watches over its dominion-the look that Lewis Carroll captured so well in the Cheshire Cat! 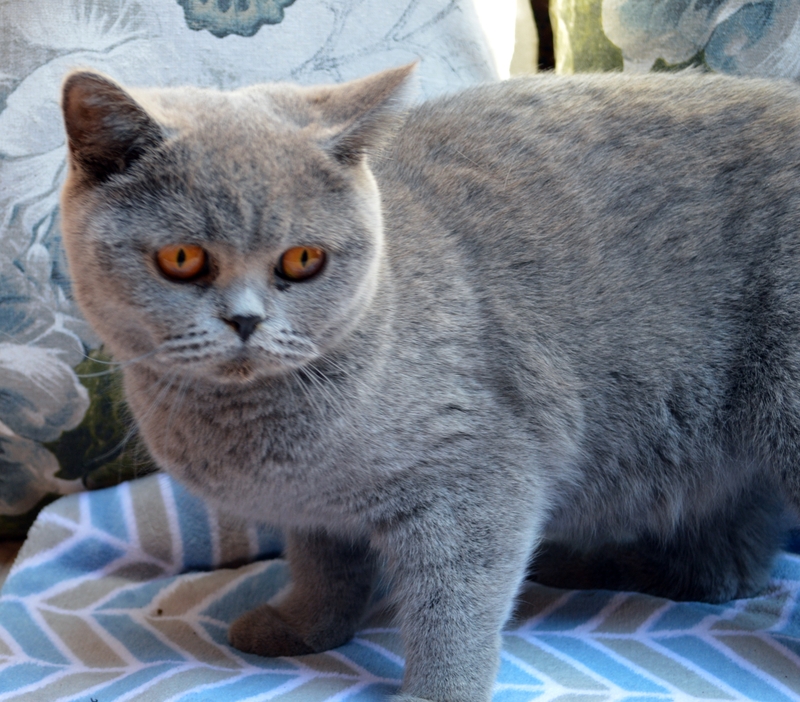 Maintaining the British Shorthair coat in top condition is easy as the coat does not tangle. A quick comb through easily removes any loose dead hair. A little extra combing in the spring and fall ensures seasonal coat changes do not leave any dead hair to turn into mats. The British Longhair coat takes more work but a daily combing prevents any tangles. It is a good idea to bathe your British Longhair regularly to keep the coat in peak condition. If you plan to bathe your cat, start when the kitten is young and maintain a regular routine so the cat learns to enjoy this extra special time with you. These cats love food and with their sedentary ways can quickly gain weight so it is important to keep a careful eye on their portions to make sure they do not get fat. They are a heavy, solid cat ranging from 9 to 18 pounds but that weight should come from their massive muscular bodies, not from an excess of food. Encouraging them to play burns calories off while toning muscles: Teaser toys provide lots of gymnastic entertainment; training your cat to fetch adds running to their day; and chasing a laser light pen gives their muscles a real work out.